Celebrity Horoscope – Indira Gandhi – India is Indira & Indira is India. This time, one of my favorite and most gutsy leader of all times. Indira Gandhi. During her prime, it was a saying that Indira was the only MAN in her Cabinet of Ministers. It was also the time when phrases like the Title herein came to fore, i.e. – India is Indira & Indira is India. Let’s take all points one after the other. 1. Ascendant – As we can see, she is born Cancer Ascendant. So, Emotional, Caring and Nurturing? Indira Gandhi and Emotional? No way, lol. I must be kidding. We will know about her nature little later but Cancer is 4th sign of Zodiac and it represents the energy of 4th house. Among other things, 4th house also represents People of Homeland. Now, why I chose that from all other significations of Cancer/4th house? It is because Saturn is in the Ascendant. Saturn is Govt, Law & Order and Service. Saturn in Cancer in Ascendant means this person’s life will be all about Service to people of her homeland through Govt, Authority and Law & Order. Another indication of same thing is Ascendant Lord Moon is in 7th house in sign of Capricorn. 7th house is Other People & Masses and Capricorn is again Govt, Authority and Law & Order. So, her life path is going into dealing with matters concerning other people through Govt and Law. Also, Capricorn’s lord Saturn is in Ascendant. It means Ascendant lord is in 7th house and 7th house lord is in Ascendant. This is Parivartan Yoga (http://astrosaxena.com/parivartan) . This yoga makes both Saturn and Moon help each other as they are sharing each other’s houses. So, she gave a lot to people & masses and masses always returned favor to her. So, her whole life was set with her ascendant as dealing with matters of other people through Govt, Authority and Law. 2. Ascendant Nakshatra – This will give an idea about her nature and this is why Nakshatras always have a higher say. Her Ascendant is Cancer, which should show her as nurturing & caring and if Saturn had not been there in Ascendant, she would have been that way. Saturn brings practicality in nature when it is in Ascendant. Now, her Ascendant Nakshatra is Ashlesha. There are few Nakshatras which have bad name. Ashlesha is one of those but if you are in Politics, it is blessing in disguise to have it. Simply and harshly put, Ashlesha makes a person to utilize the other person when needed and leave as if that person was never there and will never be there. Ashlesha is highly practical and that’s what Indira was. She never looked back in her life. She never shown any regret over any of her controversial decisions. People of her family after her and future PMs of Congress may have apologized for Emergency and Operation Blue-Star but she never even shown any remorse. Anyone would have resigned and contested again in election after Allahabad High Court verdict but maybe it was too much of a price for her ego and she chose to impose emergency to stay in power. Actually, this act of her speaks a lot about Ashlesha as the representation of Ashlesha is a serpent which is entwined. It represents our entanglements with our desires for which we can do anything. That’s what she always did. So, her nature was highly practical, at times selfish and cunning to keep entangled to her desires. Position of Ascendant Nakshatra lord will show the life pattern for her. It is in 5th house in Scorpio. Scorpio is sign of sudden and chaotic events in life. So, her life pattern remained to deal with sudden and chaotic events in life through her practical and clever approach. a. Sun & Mercury – Let’s take them together as they are conjuncts in 1 house. i. Sun rules her 2nd house of Family & represents Father and sits in 5th house in sign of Scorpio. ii. Mercury rules 3rd house of efforts & 12th house of Losses and Foreign Lands and sits in 5th house in sign of Scorpio. iii. 5th house shows Children but mainly the 1st child, so for her 5th house will show Sanjay Gandhi. It also shows things like Love Matters & Politics. iv. As we know, Scorpio & Aquarius are two signs which show our Karmic Backlog from past lives as these 2 are co-ruled by Ketu & Rahu respectively. It shows that she had some karmic backlog to repay against all these things which are represented by Sun, Mercury and 5th house. Scorpio also shows ups & downs, sudden events and chaotic moments in life, so Sun & Mercury going there shows that her family life gone through ups and downs and sudden events which was quite evident as her marriage went through turbulence. Although, it never came in light prominently but she had a turbulent relation with her Father too as he was dead against her marriage choice & she later came back to Father when her marriage didn’t stay strong. I also read that as she was going through turmoil in marriage, her father told her to meet Osho Rajnish for Spiritual Guidance by saying that Osho can change her life altogether but she didn’t do so. As Scorpio is also sign of inheritance, she inherited the legacy of her father. Sun also represents Govt & Politics and having it in Scorpio shows that she had to deal through lots of sudden and chaotic events in the field of Govt and Politics. Mercury rules 3rd house of efforts, self-will & actions and sitting in 5th house in Scorpio shows that her self-will and actions brought lots of chaotic events to her life. 5th house is also house of Love Matters and having Scorpio there itself shows a Chaotic Love Story. 5th house also represents 1st child, i.e. Sanjay for her. Mercury rules 12th house of losses. Mercury sitting in 5th house shows losses coming to her 1st child. Scorpio looks Scary, let’s move ahead. b.	Venus & Rahu – As these 2 planets are also together, let’s deal with them together also. Venus & Rahu conjunction in 1st sight shows an unusual marriage. Venus is karaka of Marriage and Rahu represents Unusual Things in our life. So, when these 2 come together, it gives an unusual marriage and her marriage was certainly an unusual one, especially in India of that pre-independence era. As she is a Cancer Ascendant, 7th house of Marriage is ruled by Saturn which is delayer of things. So for a Cancer Ascendant, it is always advisable to delay marriage till 30s as Saturn matures in 30s but she got married when she was 25 in the most unusual ways. And obviously Saturn played its part by giving troublesome times in her marriage. This position of Rahu and Venus in 6th house shows many other things. 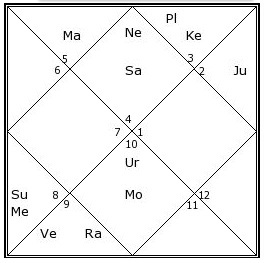 6th house is house of disputes and obstacles, having Venus and Rahu in 6th house shows her relation and marriage went into dispute. Actually, realistically speaking, she was daughter of PM of India, so she could still live a respectable life where none had guts to question her on personal issues else India in 1950s and 1960s was not so kind to any Woman with a spoilt relationship. 6th house is also of our daily routine work. Venus rules 4th house of home environment and 11th house of Earnings. Rahu also represents Foreign Matters. So, it shows that her home and work environment was same. It means she put so much time in her daily job that her office became her home. Rahu there shows that her work in daily life involved lots of Foreign Matters. As Rahu & Venus are in Sagittarius, I can assure that she was a voracious reader. She might not have taken lots of degrees but she must have read a lot in her life about various Philosophies and Religions and Different Cultures of World. c.	Ketu – When we dealt with Rahu, it is most apt that we deal with Ketu at the same time. Ketu in 12th house. Nothing much to say except that it is the most powerful Moksha Margi position among all. It means she was a highly spiritual lady and it is considered that this position of Ketu proves to be last life of person. Soul’s journey gets over after this one. She must have been a highly spiritual person though it was never on the fore. We got a glimpse of her intuitional powers when a day before her assassination, she addressed a rally in which she said – “Nobody knows how many attempts have been made to shoot me; lathis have been used to beat me. They have attacked me in every possible manner. I do not care whether I live or die. I have lived a long life and I am proud that I spend the whole of my life in the service of my people. I am only proud of this and nothing else. I shall continue to serve until my last breath and when I die, I can say, that every drop of my blood will invigorate India and strengthen it.” It shows her awareness towards upcoming events. One more thing which interests me in this speech is her use of words “I am proud that I spend the whole of my life in the service of my people”. So much language of what I wrote before for Saturn in Cancer in Ascendant. A life path of Service to people of homeland. d.	Moon – Although we have already discussed Moon with the point of Ascendant but here we can look at things which Moon is karaka of. Moon represents Mother. it is in 7th house in the sign of Capricorn, which is ruled by Saturn. Saturn represents Restrictions, Limitations and Discipline. So, she had a very limited association with her mother Kamla Nehru, who passed away when Indira was 19. It also shows that she herself was very strict mother and kind of disciplinarian with her kids. As Capricorn is sign of Govt and Law & Order and Moon represents Mind, it shows that her mind was always inclined or attracted towards matters of Govt, Politics and Law & Order. e.	Mars – Mars rules 5th house of Children, Happiness, Politics and 10th house of Career and Fame. Mars sits in 2nd house of Family, Wealth and Speech. It shows that her real happiness was with her family and children but maybe it was not meant to be as 2nd house lord was in Scorpio, bringing ups and downs. Mars in Leo as lord of 10th house of Career and Fame certainly defines her. Mars is a Soldier, Leo is sign of Govt. So, her career throughout remained as working like a Soldier for Govt and she was a Brave-Heart like a Soldier. She never did anything behind the back. Provision of imposing Emergency was always there in Constitution, is still there and maybe will always be there, but only she was gutsy enough to utilize it. None before her and none after her. Mars in 2nd house of Speech also shows a Forceful Speaker. That was also part of her fame. She was one of the best Orators among the world leaders of that time, and probably all times. f.	Jupiter – Jupiter rules 6th house of daily routines, obstacles and disputes through its sign Sagittarius and 9th house of Religion, Law, Guru and Teachings of Father. Jupiter sits in 11th house of Earnings and Gains in Taurus. Jupiter expands the results of the house it sits in, so in 11th house it expanded her earnings and gains from her daily routine life and from things which she learnt from her Gurus. Here, we have to accept that her Father was her Political Guru and 9th house is house of Teachings of Father. So, whatever she learnt and inherited from her Father proved to be useful in expanding her gains. Taurus is sign of Wealth and Assets. Jupiter sitting in this sign had expanded her wealth beyond imagination. It is noteworthy that her Jupiter MD started in 1954 and it was the time when she left the illusion (Rahu) of her spoilt marriage behind and started in active politics along with her Father. Later on, through 9th house teachings of Father she was chosen as Congress President and climbed up ladders quickly in years to come. g.	Saturn – Saturn rules 7th house of Spouse, Other People and Masses through its sign Capricorn and 8th house of inheritance, transformation and sudden events through its sign Aquarius. We have already discussed her married life and service towards other people in detail, so just let’s focus on what Saturn is bringing to her as 8th house lord. As I said, 8th house relates to inheritance, transformation, changes, sudden ups & downs in life and chaotic events. Actually, 8th house represents same energies as Scorpio represents because Scorpio is 8th zodiac sign. So, 8th house lord Saturn sitting in Ascendant means all these sudden and chaotic events became part of her life path and if we see closely then she started her Saturn MD in 1970 which continued till her Assassination and this period of her life was completely chaotic when she was dealing with one or the other major event in her life. It all started with 1971 War, then her election declared Void by Allahabad High Court in 1975, followed by Emergency, loss of Election & Power in 1977, Political Litigations against her and eventual arrest, coming back to power in 1980 but loss of Sanjay Gandhi due to an accident (sudden event), Operation Blue Star and finally the Assassination. One after the other, her life was plagued with one or the other transformative event. Within all this, Sanjay had gained ill-fame as an autocratic leader and that remained a big concern for her till 1980 as she prepared him as her heir. Stressed relations with Maneka Gandhi were also part of this timeline only. Although, she held the fort and her integrity throughout. And I continue to admire her for her gutsy leadership amidst all this chaos. h.	Parivartan Yogas – This is why it is important to give time to an Astrologer to read chart properly, lol. As I was going through her chart, I realised that she has 3 Parivartan Yogas. i. Saturn in Moon’s sign Cancer and Moon in Saturn’s sign Capricorn, ii. Mars in Sun’s sign Leo and Sun in Mars’s sign Scorpio, iii. Jupiter in Venus’s sign Taurus and Venus in Jupiter’s sign Sagittarius. So, it is important to understand Parivartan Yoga (http://astrosaxena.com/parivartan) to understand her chart. In short, whenever two planets exchange each others’ signs, they start co-operating with each other even if they are natural enemies. If both planets are friends, they will co-operate more and become great friends but even if these planets are enemies, they will still co-operate and at least be neutral and helpful to each other. A generic example to understand this concept is that suppose you are sitting in your enemy’s home, then naturally you want to destroy everything he has. Similarly, if your enemy is in your home, he will do the same. But if you are in each other’s home with this mutual knowledge that enemy is in my home, then you won’t dare to destroy anything because you know that if you destroy anything here in enemy’s home then he will destroy something in your home. At this moment, you will at least pretend to be friends for the time being. You will say that let’s have peace and don’t destroy anything and might as well take care of each other’s house. That’s how enemies will become friends. So, although she had one of the most turbulent and transformative life but all these 6 planets involved in parivartan yoga were co-operating with each other. Hence, they kept her moving ahead and kept her climbing new ladders of success. Hope this covers what I could have covered within my limited knowledge and is helpful.